This is probably one of the cutest games out there right now - the Kawaii Kitty slot game is a beautifully made game and has superb graphics and sound effects. It is bound to be popular with fans of modern video slots, because it has expanding wilds and also, sticky wilds, which makes for a great game. 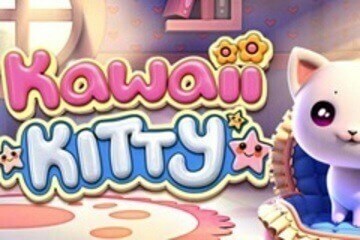 Kawaii Kitty is a 5-reel, 10-payline slot machine, powered by Betsoft Gaming. The release is inspired by adorable cats, so it comes as no surprise that the main symbols on the reels include everything feline-related, such as bowls of cat food, cartons of milk, fish toys, mouse toys, pet brushes, and tuna tins. Wilds are represented by purple and yellow yarn balls. The title doesn’t include a great variety of extras, unlike many other titles from the same software provider. Essentially, the main features of the Kawaii Kitty video slot are Expanding Wild symbols and the Re-Spins feature. Wilds can only pop up on the reels two, three, and four, however, whenever they land, they will expand, turning the entire reel wild. Moreover, once your wins have been paid, the Wilds will remain locked in their place, while the reels that are not wild will re-spun, to boost your winning potential. The biggest potential win on a single spin is 50,000 coins, while the top-paying symbol in the regular game is the carton of milk, awarding 250 coins for landing five of them on a single line. If you play out of Australia or New Zealand, we would advise you to search for the game under the pokies section, while those playing out of the UK can most likely find it among other popular fruit machines. All in all, Kawaii Kitty is a very simple, yet highly rewarding fruit machine that will, no doubt, meet the needs of both complete beginners and cat lovers. This free demo version is 100% identical to the original casino game and you do not need to register or download any software to your computer (or phone) to play - you just need to wait a moment or two for it to load in your browser and enjoy!